What Do My Friends See In The Church? When I was young I loved spending time with my grandma baking lemon meringue, chocolate pies, and strawberry jelly cake. My mom tossed marshmallows, whipped cream, and strawberry jello into a decorative bowl. My young sons would drip multi- colored spots all over the tablecloths while dying eggs. We all shrieked with delight when they bounced around the yard discovering the carefully hidden plastic eggs. Taking pictures with the Easter bunny and chasing the lambs at the petting zoo are long behind this mama. My sons are grown now and not coming home for Easter, so how do I prepare for Easter this year? On the day of Unleavened Bread, the same day that the Passover lamb had to be sacrificed Jesus spoke to Peter and John, “Go and make preparations for us to eat the Passover (Luke 22:7). So, I already missed the Passover dinner. Is all lost? Can I still prepare for Easter dinner? Here are four ideas how I am preparing this year. I’m praying that I will not fall into temptation. After Passover, Jesus had advised his disciples, “Pray that you will not fall into temptation.” The disciples had no idea how their life would be turned upside down in the next few days. How they would struggle internally during their sorrow. We should pray that we would not fall into temptation too because we also have no idea what the next days will bring either. But always remember, Sunday is coming! R. W. Dale suggested reading the four gospels (Matthew, Mark, Luke and John) as suggested by in Preparations for the Lord’s Supper. At least that is my goal, who knows what this weekend will bring? Remembering that Christ has lived a perfect life on Earth and “who by dying delivered us” (Matthew Henry Commentary). How fortunate we all are to be invited to eat and drink with Jesus. Self-examination is another important part of preparing for the Lord’s Supper. We should look for evidence in ourselves whether we are a true of false disciple. To most at that table, even Judas Iscariot, was one of the twelve. We recognize true disciples by Faith, Joy, and Love that burns within us. We are strengthened so that we can abide in Him (W. Clarkson, The Lord’s Supper). Trust Jesus with our heart, thank him for being our joy and hope (C.H. Spurgeon, The Ordained Memorial). R. Ferguson author of The Cup of Sneering and of Communion wrote, “When heart communes with heart it is like the mingling dew drops” on the rose petal. The Passover is a memorial to an unbelieving world that we believe in Jesus, who lived, died, and three days later was resurrected. Jesus is alive and still lives at the right hand of God (C. J. Ridgeway in The Holy Communion). So How did Jesus spend the Passover? Jesus desired to eat the Passover with his disciples in the guest room of a house. Not with his family like my tradition. Jesus eagerly desired to eat this Passover with his apostles reclined around a table (Luke 22: 15). He gave thanks with his disciples and breaking the bread, He said to them, “This is my body given for you; do this in remembrance of me.” He continued to explain that “this cup is the new covenant in my blood, which is poured out for you (Luke 22:20). Jesus is speaking of what is to come but the disciples were focused on other things. They were actually bickering about who was the greatest. Okay, to be honest…I can’t help but smile when I hear that a dispute began at his table too. I know all the momma’s reading this can relate. But Jesus is speaking about important topics, so let’s try to re-focus. Ouch! Are we being sifted like wheat? There are so many distractions surrounding the Easter holiday. Chocolate peanut butter eggs, Easter baskets, stuffed bunnies…not to mention Peeps! Jesus knew Simon Peter would be sifted as wheat just as we are being sifted every day. But listen to what Jesus said next, “But I have prayed for you, Simon, that your faith may not fail (Luke 22: 31). “But I have prayed for you, ___________, that your faith may not fail (Luke 22:31). Jesus knew he would fail, just as he knew I would fail. But Jesus also knew he would turn back just like he knows you will turn back too. So, if you have failed like me. Take heart, because we can always turn back. And when we do, we can strengthen our brothers and sisters. I pray that Christ may dwell in our hearts by faith. That we would all thank Jesus for forgiving us of our wrongs and for appealing to God in his last moments to “Forgive us, for we do not know what we are doing.” In his last moments, Jesus was thinking of us. Let us all this Easter, not be distracted but deliberately remember Jesus. Let us all turn back and strengthen our brothers and sisters. In Jesus’ name we pray, Amen. If you struggle with focusing on Jesus during the Easter holiday, please click the link to join my email list. 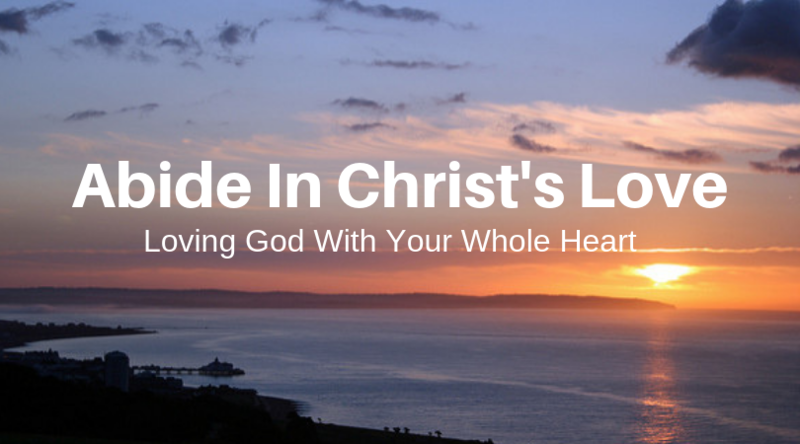 Every month you will receive a surprise that helps you Abide in Christs’ Love. For the month of April, you will receive the poem, “I Am the Way, The Truth, and The Life.” You can send it electronically or you can print it out so that you give it to others. Every day, I pose an uplifting and encouraging blog from a Hope Writer on my Facebook page. I am hurriedly walking along a dirt road near the Mount of Olives. Dust is covering my toes and small pebbles burrow under my heel. As I stoop to remove the irritation from my sandal, I hear loud voices moving in this direction. Quickly, I move off the road uncertain what this commotion might mean. I see people spreading their cloaks on the road. What in the world? A large crowd of men are joyfully praising God, “Blessed is the king who comes in the name of the Lord!” A king is coming? I move closer to the crowd and my heart beats wildly in my chest. “Peace in heaven and glory in the highest!” shouts another man. My confused eyes land on a man riding a colt. Who is he? Wouldn’t a king be riding a stallion? But the man who the men call Jesus replied, “I tell you, if they keep quiet, the stones will cry out.” Jesus is headed to the temple and I desperately want to follow. I turn to my family asking them to go to the temple with me, but no one desires to go. I’m perplexed why they wouldn’t want to hear more about the man who had performed all the miracles. Blind men can now see and the crippled are now walking! I definitely want to know more about Jesus. As I turn to follow the crowd, I call out to my friend for her to join me. But she also shakes her head, no. What would I say if Jesus stopped and asked me the same question? I would ask the Lord for my friends and family to desire to know him for who he truly is, the Son of God. Even in this day and age, I silently wonder, “Why won’t my family and friends come with me to church?” We tend to only think of church as being a building where people gather for public worship. But then I read, Philemon 1:2 To Apphia our sister, and to Archippus our fellow soldier and to the church that meets in your home. A building can’t meet in my home so that must not be the only definition of the word church. People who worship Jesus Christ and God are the church in this verse. So let’s look at my question again? Why won’t my family and friends come with me to church? They do come to church! Every time they are in my presence, they are interacting with the church. Do my family and friends know that I am a follower of the Lord Jesus Christ? This was really hard for me. What might happen if I admit the truth? Will they avoid me, not invite me to events, or stop listening to me? Even today I have difficulty posting things on Facebook because so many of my family, friends, and co-workers do not believe. After all, it might offend someone. 2. Do my actions reveal me as a follower of Christ? Do I praise God in front of my unbelieving friends and family? Oh Lord, give me courage! Do I hold my purse tightly? Loosen my fingers, Lord. Do I give money as gifts (without being expected to be repaid)? Help me to trust you, Lord as provider. 3. Do I pray with my family and friends? When I was younger, I was comforted by the fact that my grandmother was praying for me. And during certain times of my life, I would even seek out people to pray for me. And then when people mentioned for me to pray for them, I said I would. But why not just pray with them right then and there? Well, I didn’t because I was afraid to pray out loud. Maybe my prayer would be rambling or I wouldn’t know what to say. I praise you Lord for caring for all our needs. I thank you for hearing our prayers, and I ask you to heal my friend. Short, sweet, and to the point is enough. God knows our needs. 4. Am I serving others or being a good steward of God’s money? According to Dave Ramsey, “Because we are designed in God’s image, we are happiest and most fulfilled when serving and giving.” Giving is a type of praise to God for blessing us with little or much. It is all from him. Giving is a type of worship. James 1:27 Religion that God our Father accepts as pure and faultless is this: to look after orphans and widows in their distress and to keep oneself from being polluted from the world. This week find a widow, an orphan, a single parent, or a military family who has a deployed member. Ask them What can I do for you? And you have the ability, do it. If not, pray for with God all things are possible. Are you willing to hand someone a card? Lord, I desire for all my readers’ family and friends to receive you. May we all have the courage to share with others how we have been healed. Loosen our grip on our possessions and share with others who have needs greater than our own. Help us to pray with people who ask right then. Protect our hearts from anxiety and focus our minds on you being trustworthy. Help us to see someone we know who may have a genuine need that we can fill. Give us courage to do so. In Jesus name, I pray. Amen. If you struggle with sharing Jesus with others, please click the link to join my email list. You will receive the poem, I Am the Way, The Truth, and The Life so that you give it to others. Every month you will receive a new item that you can email or print out as a gift for others. You may also connect with me on Instagram. Consider following my Facebook page to view more blogs from Hope Writers. When I was in second grade I received my very first diary complete with a lock and key so all my secrets would be safely tucked inside where no one could see. Since my best friend has recently moved to Hawaii, I confided all my boy crushes and penned all my trouble-making antics at school. Yes, I confessed all on those tear stained pages. Perhaps you had a sister or a cousin who you drew close under a bedsheet tent and then giggled all night about childish cares. I hope you were lucky enough to have a mom or a grandma who patiently listened to you describe all your high school drama over a slice of warm banana bread and a large glass of syrupy sweet ice tea. If you are missing this type of intimacy in your life, then let me reassure you…there is a sweet closeness that can be experienced between you and your God, your Savior Jesus Christ, and your teacher, the Holy Spirit. Spending time with the Lord increases your emotional, spiritual, and physical health. When my best friend moved away to Hawaii, I longed for a sister or new best friend to laugh, play, and share my feelings with. I desired someone I could trust, who understood my needs, and cared enough to find out why I sometimes react to situations badly. I desperately needed to release my deepest hurts, but was fearful that my new friends might not accept me for who I truly am. I don’t think it is a coincidence that one of the most popular television sitcoms was Cheers a Boston bar where everyone knows your name. Not only do we want people to recognize us by name when we enter the room, but we also desire to share our lives with others. Can God really be trusted with your secrets? Have you ever considered that God may desire to be fully loved and known by you? God created you so he already knows your deepest hurts, needs, and buried secrets. He is trustworthy and will never betray your confidence. He is our Confidence. Are you willing to share your heart fully with your Savior? Or are you fearful because of shameful secrets? Perhaps when you envision God, you feel secure like a toddler in his Daddy’s arms. But just maybe when you think of God, you are frightened out of your mind because you know you have sinned against Him. Maybe you feel unworthy and are hiding your secrets from him like Adam and Eve. Maybe you are angry like Job because you feel God has allowed something in your life that has hurt you deeply. How do you fulfill your needs? If you do not view God as a safety net, then what are you turning to instead? Are you seeking a marriage to fill this need for intimacy? Do your co-workers provide for your emotional needs? If you have never discovered deep intimacy with God before now, there is hope. Or perhaps you need to rekindle your relationship with your Savior. God is still waiting for you to discover his perfect love. You don’t have to strive to be perfect in order to grab God’s attention. And you shouldn’t feel like my Grandmother who was convinced that a lightning bolt might strike her dead if she dared to approach the throne of God. We have joy and freedom in Christ. We can take a walk through our neighborhood and talk to God in much the same way that Adam and Eve experienced in the garden. When we draw near to Him, he draws near to us. Only God’s hand heals our wounds. He is the Great Physician and our Wonderful Counselor. He speaks truth into your soul and removes selfish desires. He already knows your name and won’t reject you. Jesus touched the lepers with his hands and healed the forgotten. God knows our lives are riddled with mistakes, but He has made a way for us to be reconciled with him. Jesus is standing right now outside the door of your heart and knocking. He calls out your name. Just like any relationship, real intimacy with God takes time to develop. He doesn’t just want a one-night stand, but desires a committed relationship that lasts forever. Begin building emotional intimacy with God today. Take 5 minutes to talk with him. Tell him your burdens, your needs, and your accomplishments. He desires to hear it all. Trust him to provide. Listen to his Son, Jesus. Heavenly Father, you are justice and perfect love. I thank you Lord for removing the heavy burdens that buckle my knees. Thank you for revealing to me that nothing is hidden, all things will come to light. May all my readers who hear your whispered word turn and proclaim your truth from the mountaintops. Lord you never forget your children and even know the number of hairs on our heads. As long as we acknowledge you before all, then the Son of Man will acknowledge us before the Angels of God. Thank you Lord for forgiving anyone who doubts your timing. Holy Spirit, teach what we should say when we talk to our Heavenly Father. Give us restraint to wait and wisdom to listen. In Jesus’ name I pray. Amen. Pedersen, T. (2018). New Study Examines the Effects of Prayer on Mental Health. PsychCentral. Please comment about how you envision God. I hope you Join the Monday Club. If you subscribe by email, you will receive my blog posts in your email every Monday morning and monthly special gifts, which you may print out in order to bless others. Heavenly Father, you are my blessed King. I love you and am content to sit still in your presence. You are the great healer of the world. You alone nourish me both physically and spiritually when I draw near. Your power breaks any chain of sin that desires to enslave me. Through your power, I live free. Although I chose the sin that strangles me, you still choose to free me. I praise you Lord for always delivering me. It pleases you for your children to plant the seeds, but only you breathe life. Only you know when each sprout will push through the hard shell. Thank you Heavenly Father for sending your son to the earth. Daily, Jesus lifts up all my heavy burdens. He heals my broken heart, hurts, and fears. He carries my disappointments, anger, and hopelessness on his shoulders. He has transformed my torn heart into a grateful spirit. Forgive me for my pride. For struggling with these feelings instead of bringing them to you. I pray that today I would be purposeful as I celebrate you as my deliverer. May my heart open and be teachable. Open my ears so I hear your whispers. Open my eyes so I see your daily miracles. I trust your faithfulness and your love. Thank you for healing my loved ones physically and softening their spiritual hearts. Please comment or celebrate how Jesus has freed you from any sin. This will encourage others who may be struggling through the process you have been freed from! For example, Jesus has freed me from anger. Praise His Holy Name! I hope you Join the Monday Club. If you subscribe by email, you will receive my blog posts in your email every Monday morning. Then you will never miss an encouraging word. By joining you will also receive a special gift, a poem (image below) which you may print out in order to bless the women in your life. What is it about prayer that makes a person fearful to bow their head in a public restaurant and speak out loud? Is it because prayer is banned in public schools? What is it about holding your spouse’s hand and praying for your children that seems a bit uncomfortable? But yet we know that we desperately need to pray for our health, for our heart to be healed, and for our attitude to changed. We desperately need the strength to shoulder our responsibilities, to see lies that are presented as truth, and for forgiveness to reign. We need love, romance, and intimacy. When none but God is near (Adeney). If you are determined to overcome all that hinders your prayers, Check out this 60 second guide for more effective prayer. Confess your sin and do it no more. It is easy to see the flaws of everyone around us, but we can’t see our own. We rename it and rationalize it. Because everyone does it, we think it is okay. But we need to ask Christ to reveal our sin to us, acknowledge our part, and then turn from it. “If we confess our sins, he is faithful and just and will forgive us our sins and purify us from all unrighteousness (1 John 1:9). Pray in Secret. Finding a quiet room, closet, or even your car can be a refuge where your soul can seek God. Ask God for what you “need.” You do not have because you do not ask God (James 4:2 NIV). If any of you lacks wisdom, you should ask God, who gives generously to all without finding fault, and it will be given to you (James 1:5 NLT). Don’t ask for things to please yourself. Take delight in the Lord, and he will give you the desires of your heart (Psalm 37:4 NIV). Show Honor to God. Praise God for who He is. He is Honorable, Almighty in Power, the Great Physician, and the One True God. Pray for the poor and your response. Do not doubt, but expect God to answer. If you abide in me, and my words abide in you, ask whatever you wish, and it will be done for you (John 15:7). Heavenly Father, You are Wise, Honorable, Trustworthy, and Merciful. You are my salvation, my righteousness, and my peace. I thank you for walking with me every since I was a child, for teaching me your ways, and loving me with a deep tender love beyond my understanding. I confess that I worry needlessly and fears paralyze me from praying with people who need you. Help me to see any hidden sin and give me the fortitude to change my ways. Lord, I need your wisdom in order to make the upcoming decisions. Forgive me Lord, when I don’t delight in you Lord. Help me to carve out time in my daily schedule to spend in your presence which is always a true delight for my soul. I pray for the people in my community who need food, clothes, and homes. Raise up your church to meet their needs. Reveal any action that I should take. Help me to forgive the people who hurt me today with their thoughtless words and actions. Heavenly Father, I know you are a good father and always hear my prayers. I thank you Lord that you know my needs and I trust your judgement that your timing to reveal your answer to me is perfect to my needs. In Jesus name, I pray all these things. Amen. Please comment or share ideas about how you make your prayer time more effective. In Jesus glorious name I pray, Amen. That’s why I’m excited to invite you to a live training hosted by my writing friend Emily P. Freeman. Please comment or share if this prayer blesses you. I hope you Join the Monday Club. If you subscribe by email, you will receive my blog posts in your email every Monday morning. Then you will never miss an encouraging word. By joining you will also receive a special gift, a poem which you may pass on to bless the women in your life. How, When, and Who to Honor? Every soldier in the U.S. Army, receives a SMART book during basic training which explains how, when, and who to honor. Drill Sergeants instruct soldiers to salute officers and authorized civilians of higher rank. All soldiers are expected to show respect. To do otherwise brings disgrace to your branch of service. When we honor people we are regarding them with great respect. The bible states respect everyone and love your Christian brothers and sisters (1 Peter 2:17 NLT). However sometimes we give certain people higher degrees of honor. For example, we often stand to attention when the President enters the room. Rooms burst into thunderous applause as government leaders and rock stars approach the microphone to speak on a stage. But only one is worthy of the highest regard of honor. You are worthy our Lord and God, to receive glory and honor and power, for you created all things, and by your will they were created and have their being (Rev 4:11 NLT). We should honor the perfect divine son of the One true God, because Jesus redeemed us. When is the right time to honor? Soldiers stand at attention whenever they hear the bugle call of the Reveille in the morning. Even at the end of the day when the bugle sounds during Retreat everyone stops working in order to render the proper honor. Service members driving vehicles, will stop and exit in order to render their salute. When the Lord spoke to Moses in Exodus 34:2, He told him to be ready in the morning and present himself to Him. I can’t help but notice that the manna that the Lord supplied was only available in the morning, but as the sun grew hot it melted away (Exodus 16:21 NIV). Jesus is the bread of life (John 6:35). Are we missing out if we wait til the end of the day to connect with our Lord and Savior? If we choose to connect with our Heavenly Father after busy workdays, we are in good company. “And after he (Jesus) had dismissed the crowds, he went up on the mountain by himself to pray. When evening came, he was there alone” (Matthew 14:23 ESV). How can we Honor Jesus? We honor Jesus when we obey him. We honor Him when we choose to spend time alone with Him. It can be as simple as taking as walk. Giving thanks, laying down your worries, and sharing your heart with Him. We can also honor him by showing reverence to his name, word, and commands. Actively listen to his Word. Even civilians have traditions to honor their leaders. During Dr. Georgia Lorenz’s inauguration at Seminole State College, friends, faculty, and community members all stood to show respect as she walked at the front of the procession followed by faculty and staff in their academic regalia. But thanks be to God, who in Christ always leads us in triumphal procession and through us spreads the fragrance of the knowledge of him everywhere ( 2 Cor 2:14 ESV). Jesus is victoriously leading and I am blessed to be part of his triumphal procession. If you have accepted Lord Jesus as your Savior then you are part of the procession too. Our lives are a Christ-like fragrance rising up to God. But this fragrance is perceived differently by those who are being saved and by those who are perishing. To those who are perishing, we are a dreadful smell of death and doom. But to those who are being saved, we are a life-giving perfume (2 Corinthians 2:15-16 NLT). Think back on yesterday’s schedule. Reflect on how, when, and who you are honoring. Heavenly Father, we praise you because you alone are worthy of glory and honor. We thank you for your Spirit of Truth who teaches us to esteem you above all others. I ask that you place the desire in our heart to connect with you in the morning and at the end of each day. Remove any faulty thinking and help us to obey. May we show reverence to your name and actively listen to your word. Place a song of worship on our tongues and give of courage to speak to others how you have redeemed and restored our lives. Feel free to comment on this page about how you honor God. I’m certain your words will be encouraging to another reader.